Press here to read the article about Austin being named the sexiest city in the USA. I've never been there so please excuse me of any stereotype in the drabble. “I read that Austin is the sexiest city in the States,” Bingley said. “Such a backwater place?” Darcy frowned. “The survey said because it’s hot here,” Bingley tilted his head towards the two girls who just entered the bar. “That’s why people wear less. That blond goddess is divine.” He stood up to chat to the women. “Stop picking up trashy women!” Darcy uttered in low voice but he followed his friend anyway, to prevent him from being ripped off by some sluts. After several drinks and an hour of conversation, he was proved wrong. The Bennet cowgirls were hot, smart and independent. Jane was the family’s accountant and Elizabeth the vet. When Bingley left with Jane for a dance, Darcy did the unthinkable and asked Elizabeth for a dance. With that parting shot, she walked out of the bar with a sway of her hips. Darcy looked at the tight shorts hugging her delicious derriere and the colourful cowgirl boots framing the long legs, he wouldn’t let her out of his sight, without apologising. He raced after her into Austin. The Broken Spoke as suggested by Helen Ginger. Photo from Broken Spoke in Austin. 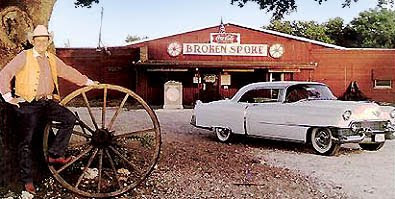 Ahh, they were at the Broken Spoke, I bet. Hope they brought their dueling guns.